July 3, 2012, will go down as another day of firsts in the Research In Motion history book. Today, RIM senior execs took to Canadian media like never before in a coordinated effort to tell their side of the BlackBerry story and gain some control over the message being portrayed in the media. Heck, in addition to giving interviews, we even saw RIM's CEO Thorsten Heins publish his own opinion editorial piece in Canada's The Globe and Mail. You can't take control of your message more directly than that. CrackBerry was not left out of the media blitz; this morning I had the opportunity to speak to Rick Costanzo, RIM's brand new Executive VP of Global Sales and Regional Marketing. And by brand new, I mean brand new - Rick stepped into this position, formerly held by Patrick Spence, this past Friday. Rick may be new to this role, but he is not new to RIM, having joined the company in 1999, literally two weeks before BlackBerry launched. I encourage you to listen to the 15-minute interview above. Rick is a straight talker and didn't try to sugarcoat the challenges the company is facing. 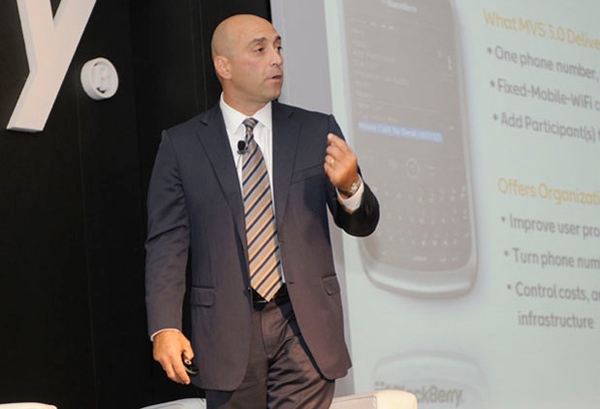 He was also confident and excited about RIM's future prospects and the mobile computing platform RIM is building in BlackBerry 10. Rick is also a big fan of CrackBerry and reads the site regularly, so he knows just how much the confidence of CrackBerry Nation has been shaken following last week's earnings report and news that BlackBerry 10 will be delayed until 2013. Questioning Rick on the change in BlackBerry 10 launch date, Rick emphasized just how important it is that the company get it right. "We have one opportunity to get BlackBerry 10 launched properly, and we're going to get it right. This is not just a handset OS. There's a car component to this. There is an embedded component. This is a platform and we're putting the plumbing in place to connect to cars and OEM. You gotta get it right and it's hugely complex. We'll come out extremely strong next year a with a fully-baked product." "That's a big shift in the organization. The company is being very pragmatic. We're taking some difficult decisions onboard. But we're making the right decisions." While I think CrackBerry readers understand the need to push back the launch date in order to launch a better product, the big question that has been on our minds since last week earning's call is whether RIM still has the time and talent to get the job done. With the stock price getting hammered, and RIM's earnings trending in the wrong direction, there's been a lot of speculation that RIM is in an irreversible downward spiral and that we'll never get to the point where we see BlackBerry 10 launch. To that notion Rick made it crystal clear that RIM completely understands the challenges they face and that RIM fully believes the best course of action on which they can execute is to bring BlackBerry 10 to market. "Nobody is delusional here. We get it. That's why we're building BlackBerry 10 and man are we committed." "For the guys that are calling for our demise I would say $2 billion dollars in the bank, zero debt and continuing to grow net cumulative subscribers every single quarter does not sound like a company that is about to go under." On this Rick noted that they think BlackBerry 7 still has legs for a long time and will continue to act as a "bridge" until BlackBerry 10 proliferates the product portfolio. RIM is still in the process of launching BlackBerry 7 in new markets, where it is being well received. These markets are outside of North America of course and often get dismissed by US-based media, which Rick took the opportunity to address. "Another thing I would say about all the media attention out there... I would say that the US is a hugely important market, but it's 10 points. It's 10% of the addressable (handheld) market, but the US is also 90% of the voice (for media). That's why RIM is being proactive in getting the message out there." With belief in BlackBerry 10 and confidence in RIM's ability to keep the business going until it comes to market, Rick emphasized the company's need to focus on execution. He also noted what I observed last month at BlackBerry World, which is that this new RIM appears to be working together very well. "Through the course of 13 years I have never felt that the management team has been working as tightly as we are right now." Even in the area of attracting developers to the platform, Rick highlighted the efforts of the developer relations team that is "doing AMAZINGLY better with developer community since Alec Saunders came onboard." Overall the conversation and message being portrayed by RIM today is one of awareness and focused determination. "We're resilient and we're pragmatic. We're not the first company that's had to go through a transition and we won't be the last. We're fully aware of the challenges in front of us. We've been extremely thoughtful in terms of how we navigate through this transition. We've got the intestinal fortitude to persevere through these challenges over the next couple of quarters. We're excited by the feedback were getting from carriers, the dev community and distribution partners on deck." "We're fully aware of what we're building with BlackBerry 10. If we get this right we're set for the next ten years." And with that I have my own theory on what the 10 in BlackBerry 10 now stands for. Sure, it may have initially emerged as the long form of BBX -- the original mashup of BlackBerry and QNX that RIM was going to call the new platform but had to change due to trademark issues. But I'm beginning to think it stands for 10 years. As in, if we just execute and bring BlackBerry 10 to market successfully we'll have a platform that sets us up for the next 10 years. Nothing would make me happier than to see that come true.